Bring home our marble-like wall/floor tile, natural oak wood strip veneer vanity, and our Lounge bathtub to give your bathroom a face lift. Icon is a bathroom unit featuring a natural oak wood strip veneer, specially treated to bring out the depth of the wood grain. The drawer features an integrated J-shaped pull handle in the front, and the sides come in an exclusive colored finish. The accessories and mirror are made of aluminium and are available in the same finishes as the drawer sides. Part of the Lounge collection by designer Simone Micheli, this freestanding bathtub is available in both an oval and a square model. The NK Concept series incorporates what is referred to as cold water opening technology – this means that the faucet lever can only be moved to the left, allowing for easier temperature control. This set-up ensures that hot water is used only when necessary, and in turn provides automatic energy savings. The continued use of heaters is avoided and both energy consumption and CO2 emissions are greatly reduced. Available in chrome with a matching sleek design to the NK Concept faucet, this floor mounted, single lever bathtub filler features both a hand shower and faucet. 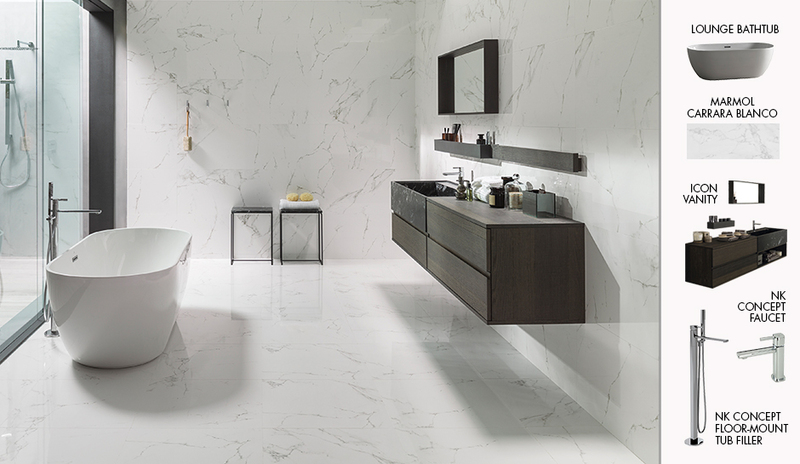 A ceramic tile in a gloss finish, Porcelanosa’s Carrara tiles have a soft marbled appearance that can bring glamour into your home. The beautiful combination of white and silver is bound to make an impression! Visit one of our showrooms today to meet with one of our design consultants and work on creating this unique look in your home!